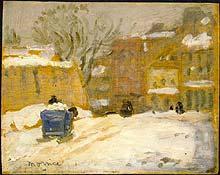 Morrice's Street in Quebec, National Gallery of Canada collection. As part of a continuing series about Ontario lawyers eminent in fields other than law, this time capsule features lawyers also known as artists. Probably the most internationally renowned Ontario lawyer/artist is James Wilson Morrice (1865-1924). Morrice studied at Osgoode Hall Law School from 1886 to 1889 after having graduated from the University of Toronto. His legal studies remain a footnote in biographies of Morrice, all of which note that he never practised law. Morrice's name, however, was listed in the Canadian Law List for one year, 1890, but whether he actually practised, although unlikely, is something we may never know for certain. Morrice left for Europe in 1889 or 1890 where his art career flourished, and he "was more visible on the international scene than any other Canadian painter of the early 20th century," according to the Dictionary of Canadian Biography . 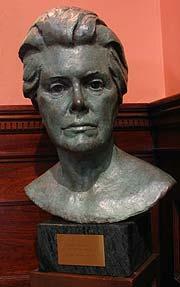 Jarvis bust of former Law Society Treasurer Laura Legge. Another Ontario lawyer who achieved fame as a painter was Thomas Harold Beament (1898-1984). Beament was called to the Bar of Ontario on 18 Jan. 1923, and practised law for one year before abandoning the profession to focus on his art. Beament served in the navy in both the First and Second World Wars, achieving the rank of Commander, and was one of the painters that the Canadian government sent overseas to document the Second World War in art. Focusing primarily on painting Canadian landscapes, Beament's works include the Arctic scene of an Inuit in a kayak, the image of which appeared on the Canadian ten-cent stamp for years. Long-time Law Society administrator Kenneth Phillips Jarvis (1926-2007) managed to combine an active legal career with several artistic pursuits. His admirers describe Jarvis as a true Renaissance man: he was a singer, talented photographer, and nationally renowned sculptor. Explaining his passion for sculpting human faces, Jarvis once told a Globe and Mail reporter: "It is a biography at the end and a kind of mystical union. You get to know a person so intimately so soon." Jarvis's busts of legal personalities ornament Osgoode Hall and other legal centres across the country. 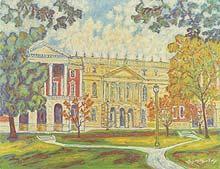 McMurtry Christmas Card Featuring Painting of Osgoode Hall. Former Ontario Chief Justice R. Roy McMurtry has excelled at several careers: lawyer, athlete, politician, diplomat, judge, university chancellor, and artist. A keen advocate of Canadian legal history, McMurtry is the founding father of the Osgoode Society, and has served as its President for the past twenty years. An amazingly prolific artist for such a busy man, McMurtry, whose sketching partner for years was Group of Seven artist A.J. Casson, primarily paints vibrant landscapes that one Globe and Mail reporter aptly described as "jubilantly colourful." Morrice, Beament, Jarvis, and McMurtry are only a few of the artists among the Ontario legal profession, others of whom will be featured in future time capsules.